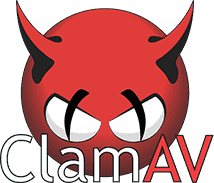 ClamAV (Clam AntiVirus) - is an open source antivirus engine for detecting trojans, viruses, malware & other malicious threats on mail servers, but it can also be used on desktops. -r - Scan directories recursively. -i - Show only infected files. /home - Directory of scanning. Note: To scan the entire system (/) you must to run a program as root (using sudo). Note: This command will only show the infected files, but will not clean them (remove virus from file), send to quarantine or delete. –bell - Sound bell on virus detection. –max-dir-recursion - The maximum depth of search in directories. –exclude-dir - Don’t scan directory. –copy - Copy infected files into directory. –move - Move infected files into directory. –remove - Remove infected files. Be careful! To automate the scanning, you can use the Cron task scheduler. To do this, you need to enter several lines in the file /etc/crontab. Now scanning will occur automatically every day at 3:0. A twenty minute period required to complete the freshclam (update the database). Note: Set any time you like and replace the string /usr/bin/clamscan -r / to necessary. In fact, this is not a virus. PUA - Possibly Unwanted Applications. Script.Packed - The script is packed (archived).